I'll admit to being biased when it comes to splits. I immediately think of "throwaway tracks" and bands just using it as a stopgap until their next full length. 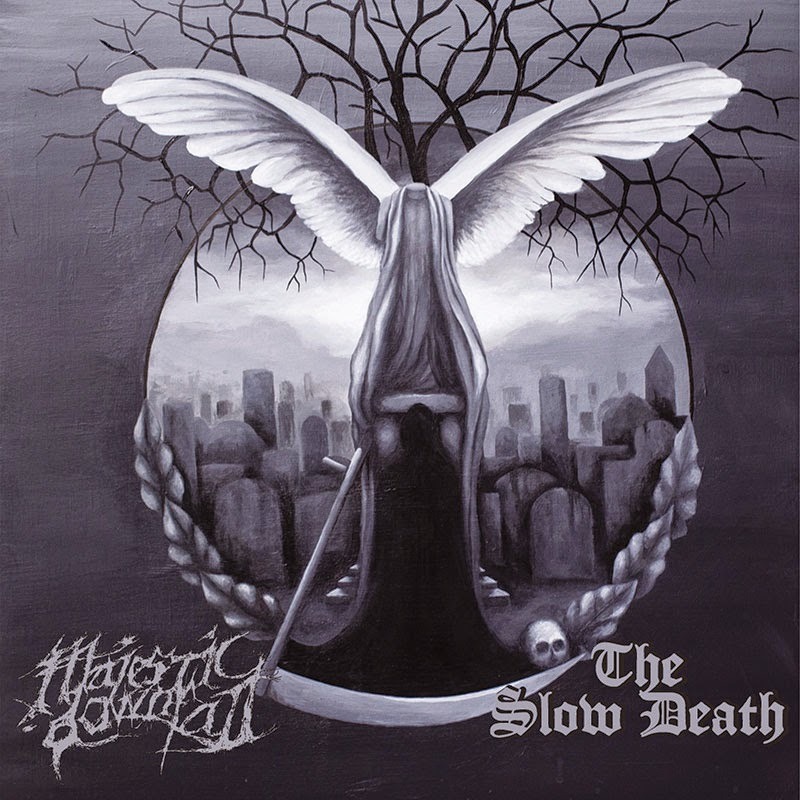 So when I heard that Majestic Downfall (viva la Mexico), who I very much enjoy, was doing a split with a band I never heard of, The Slow Death, I was curious, to say the least. Majestic Downfall just came out with a damn good full length album last year, Three. Were these leftover tracks not good enough to make the cut on that album? Majestic Downfall is the brainchild of Jacobo Cordova, how could one man have this much new material so soon? And this is a death/doom, not 60 seconds grindcore songs. So what gives? Well, I'm ecstatic to be soooooo thoroughly wrong. These 3 songs and 35 minutes are quite simply the best thing Majestic Downfall have ever done. And out of the 100+ albums I've heard (so far) this year, its easily the best of the bunch. It has a little bit of everything: doom, death, grind, emotion, change of pace, peaks and valleys. Heck, even it's softer moments (when you can breathe) only help to accentuate it's overall brutality. It's masterfully written and beautifully put together. Everything sounds so good, lush and organic. "Dark Lullaby" features the best riff Jacobo has ever come up with. Heavy, melodic and memorable. I never once felt cheated for it's 13 minute runtime. I especially love the fast section toward the end of the song before it turns back to the main riff and the delicate picking to finish things off. Overall the fastest and most uptempo of the songs here. It feels over almost too soon. How is that even possible? Best song of the year and best 13 minutes of the past decade. "Renata" is next, and follows in a similar vein. It's a bit doomier and more introspective (which I would expect for a song named after your oldest daughter). Not having the benefits of the lyrics, it feels like the trials and tribulations a father would go through raising a daughter. There's this sense of trying to keep going in the face of exhaustion. "Obsidian" is the final and doomiest track (probably most reminiscent of their prior material). Wonderful bass parts throughout this whole song. That uptempo riff at the end excites a positive riot in my brain. Also, I must praise the work done by Roberto Granados. His solos all over these 3 tunes are nothing short of bliss. Incredibly tasteful with a wonderful tone, I wouldn't change a single note. As I mentioned before, this was my introduction to Australia's The Slow Death. So I had a proper frame of reference when writing this review, I went back and listened to their prior two full lengths albums. Unlike their partners in this split, The Slow Death are mired in almost a funeral death doom plow. Stylistically anyone familiar with their prior work will feel right at home with these 3 new tracks. The overall production might be a little cleaner, the female vocals more prominent, with a few more touches of gothicness as well. But don't fear, the ultra deep death growls remain and feel much more focused and striking. Even though there isn't really an ounce of "urgency" in their approach, this feels more immediate, like a band finally firing on all cylinders. I will admit, this took more time than usual to really sink into my cerebral cortex. At the end of the day though I'm glad I was fortunate to stumble across this band. They already have a new full length album in the works for later this year/early 2015. In conclusion (how trite, I know), this is probably the easiest $6.99 purchase recommendation I can advise you to make. Heck, the Majestic Downfall tracks are worth that price all by itself. And if you're a fan of The Slow Death and never heard Majestic Downfall, that's a wonderful bonus as well. 67 minutes of music goodness awaits thee.